Silver linings don’t materialize out of thin air, or magic. We weave our own silver linings with the threads of our own imagination, spirit, and courage. When we suffer a trauma — job loss, injury, death, or something bizarre and out of the blue, people commonly talk of silver linings. “Opportunities being born out of crisis”; “When one door closes, another opens”; “God doesn’t give you anything you can’t handle.” We hear this all the time — right? We can’t always know what the better thing is, but something better is coming. When you’re reeling from trauma, it takes a lot to really believe that. We can mouth the words and go through the motions. But we yearn for some kind of certainty, the rope to grab onto, or a GPS device that will guide us to that better place. Or maybe just a trail of breadcrumbs. And the fact is, it is not a forgone conclusion that things will be better, that a new door will open, or a new opportunity will arise. Life frequently throws things at people that they can’t handle—events like the death of a child or a mass catastrophe. Some people do not survive trauma well; an unexpected tragedy can lead to emotional breakdown, self-destructive behavior, and chaos in general. Silver linings are not inevitable. The people that survive and thrive are those that are determined to do so. But so much is out of our control. — Natalie was having severe headaches; she was in so much pain one day that her husband brought her to the ER. She was diagnosed with an inoperable brain tumor that day. Three months later, she died at age 51. — Joe, an apparently healthy man of 56, was walking his dog one winter evening when he fell and was knocked unconscious. He’d had a severe stroke. He will be in rehabilitation for years. — Judy’s husband started drinking again, and within a few weeks, fell apart, drank all day, lost his job, and became abusive. She was forced to separate, sell her house, and divorce him. All of these things were beyond the control of the individuals and their loved ones. Life can be damned unfair. Sometimes, things are broken or lost and nothing will ever fix them or bring them back. The grief hurts in an unimaginable way. The only thing that one can control is how to respond; how to reimagine and rebuild our lives. Silver linings don’t materialize out of thin air, or magic. 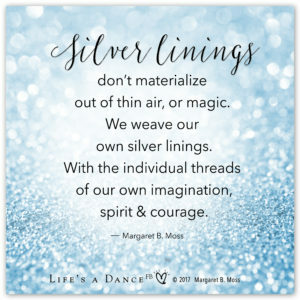 We weave our own silver linings with the threads of our own imagination, spirit, and courage. And you could say that these silver linings that we weave become the safety nets, or cradles, for our own resilience. We are weavers. Our yarn is intellect and perseverance. And, yes, faith — in a higher power or ourselves — that things will get better. We need to allow ourselves to cry, grieve, and rage at the unfairness. And then we set about reclaiming our power. What can we do about situations that are totally beyond our control? • Let go of anger. For me, I was angry at the people made decisions that hurt me; they were unfair and wrong. They’re mean-spirited actions caused all kinds of disruptions in my life. But with practice, I’ve become better at letting go of anger. I am standing alongside this person — the former me — now fascinated that I don’t feel more deep organic anger. When we feel anger and burning resentment, it’s as if we expect own anger to have the power to hurt the other. But of course, it only hurts us. • Grieve what has been lost. Whether it’s a loved one or an intrinsic part of your own identity (e.g., job, marriage), you need to be compassionate with yourself. • Do not numb. Self-medicating with food, alcohol, or your drug of choice is not a solution. You can dull the pain, but the pain will still be there and you’ll dull your entire life in the process. • Be on the lookout for wonder. Remain alive and alert to wonder, and your own inner voices. If you allow yourself to remain open, new ideas and possibilities will present themselves. How? We never know. That part is a mystery. Notice new stirrings. It is true that burned ground is also fertile ground for re-growth, actually and metaphorically. When the ground and its vegetation is burned, it becomes fertilizer. When certain stuff is gone, there is more space. For what? Be listening for the answers. • Have faith in yourself. Trust the process. One step at a time, one day at a time; every “next right thing” you do will, in fact, move you forward. • Do the work. Show up every day and be present in your life. Be compassionate for those days when things are just too much, and you want to pull the covers over your head. Some days, you might do that. Some days, it will take enormous effort to just go through the motions. But it is necessary. In this process, nothing is a given. Nothing is certain. The process of how life is rekindled within us can be traced to a spark, followed by another, and then perhaps a gentle breeze of compassion. Tend that glowing spirit. It is that spirit, call it the weaver, that will use threads of your own making — in the form of hope, imagination, perseverance, and courage — to weave your own silver linings. Absolutely beautiful and so honestly truthful……thank you. This is so beautiful. Thank you for sharing. The whole post touched my heart in so many ways, especially since I’ve had a tough couple of years. Some days I just don’t feel like going on, then I remember there are people much worse off than me, like my beautiful daughter-in-law who is my sons TwinFlame. She has triple negitive breast cancer which is the toughest breast cancer to cure because of the extreme reaccourance rate. She’s had to endore several injections of a type of chemo called red devil, which for me, just the words sound terrifying, let alone having it injected into your body. Now she’s have 10 weeks of chemo then a double mastectomy with spacers implanted for a year before she can have breast augmentations. This all happening to a young woman who just turned 30. Every day My prayer for her is that she defies the odds and is the one person who lives to a ripe old age. I love her as if she were my own child and would do anything to make all this go away for her. Sorry that I shifted my posting some what, I just wanted you to know how grateful I am for your beautiful words. I’m also trying to decide if I should send this posting to her. Today marks one year since my sweet uncle passed away. This was beautiful to read, especially today. I sent it to my aunt, hoping that it will help her, too. Perfect timing. Thank you. Even in the mist of the chaos I find peace in knowing that everything is a process to becoming more than we are today. This was a wonderful read filled with passion and hopefulness. We can weave the best pattern ever known using the severed threads that was never meant to be seen. Thank you so much Colleen. xoxo Prayers sent. Thanks Margaret for this and your other inspiring and empathetic blog posts. Self-compassion is often tough and can take a lifetime to learn. I have read several books to help myself with it. Also, self-loathing seems to be a growing problem in our society these days with people comparing themselves to all the idealized versions of their friends, relatives and acquaintances that they see on Facebook and other social media. “You don’t have to LIKE yourself all the time,” I said. “But we do need to LOVE ourselves.” That means taking care of ourselves: eating right, getting enough sleep, doing the things that we can to improve our situation. It seemed to help. Thank you Dave. Beautiful reflections and insights for the kids. And, I am sure that it did help.